This lesson plan is a great way of getting students to find out more about the few skyscrapers in London. During the lesson students will learn vocabulary describing the the building and its structure. The video is an excellent intro to the lesson from IELTS Objective intermediate coursebook about Gherkin that also practises the usage of gerund and infinitive. I used this plan during few classes with intermediate level students. Students were very excited when they could deepen their knowledge about London and its architecture. 1. Ask students whether they know the names of the most famous buildings in London. Elicit ideas e.g. Big Ben, Buckingham Palace, Westminster Abbey, St Paul’s Cathedral. 2. Tell them they’re going to play ‘Heads Up’. I first saw this game on an American talk show Ellen DeGeneres. The purpose of the game is to give definitions of the words that are printed on the paper- worksheet Ex1. Students should be divided into pairs, each person seats opposite his/her partner. One of them is given a pile of cards that s/he can’t look at. The other member of the team has to explain the word that is written on the card. My suggestion is to give out 4 to 5 cards and allow 1min to explain the meanings. Student holding the card should lift it above his head and the other should give some clues to guess the word on the flashcard. Be careful as students cheat sometimes, so either print out the words on a colour paper or print the words in grey. At the end of the activity you will probably have few of the places that students didn’t manage to give the definitions as they don’t necessarily know a lot about them. Concentrate on two of the places, the Gherkin and One Canada Square and show photos representing both buildings and theirs location, you could add that both of the buildings are currently used as offices but there are few restaurants inside as well. Answers to Exercise 2: The Gherkin: curving shape, glass, smart building, blinds. 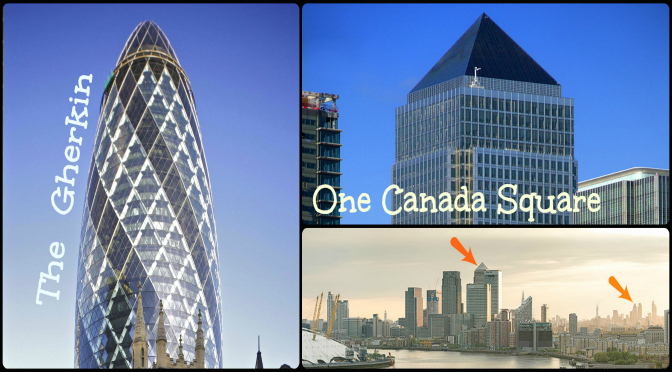 One Canada Square: pyramid roof, stainless steel, bulky, dominant. d) living creature – it’s a smart building that adjusts to the changing weather in London. At the end of this lesson you could ask students whether t they’d like to visit The Gherkin and why. Another activity you could do is included within Unit 10 from IELTS Objectives ( intermediate level). This activity is dedicated to the architect who designed the Gherkin and also introduces the grammar point, precisely gerund and infinitive.